It’s March Madness time and nobody loves posting his bracket more than yours truly. 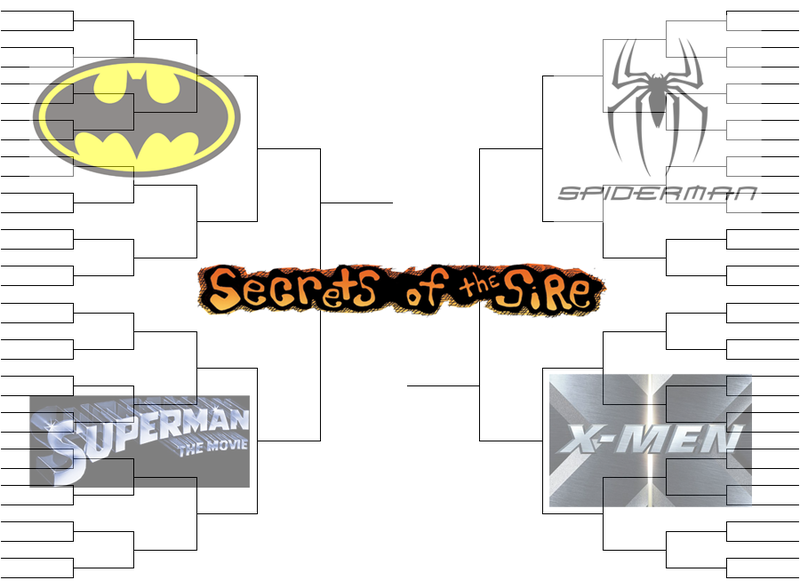 So in the spirit of the season, Secrets of the Sire is launching its first ever Comic Book Movie Franchise Final Four! What does that entail? Glad you asked! First, we took the biggest comic book movie heavyweights we could think of – and by that we mean the franchises with the most “total” number of films. Next we added a little wrinkle: each of these franchises have to have had at least one “reboot” to qualify. Finally, no “spin-offs” allowed (sorry Deadpool fans) – we want to rank the best tent pole flicks and tent-pole flicks only. And that has left us with four comic book movie franchise finalists: Batman (Tim Burton, Christopher Nolan, Joel >gasp< Shumacher), Superman (Richard Donner, Zack Snyder, Bryan Singer…those other two guys), Spider-Man (Sam Raimi, Marc Webb) & The X-Men (Bryan Singer, Brett (ugh) Ratner, Matthew Vaughn). So…what comes next? Easy! Tune into TalkingAlternative.com Friday March 4th at 11am ET where we welcome Sergio Renwick of Bad Coyote Funky to help rank the films within each franchise best to worst. We’ll aslo be Periscoping and YouNow‘ing live via our handle @Michael_Dolce. The top 4 will then advance, March Madness bracket style, into the next round immediately following the conclusion of our show. Each week after we’ll pit the 4 most popular/best versions of each movie franchise against each other in a weekly poll on our Twitter feed (@Michael_Dolce) starting with the Batman bracket – and leave it in your hands to see which film emerges as the best in that franchise. Don’t agree with our choices? Simply Reply to the Tweet with the version of Batman (or others) you think should win. The write-in voted WILL be tallied! And that’s it! Once we weed through the best franchises we’ll the pit the two DC comic book films against each other on one side of the bracket and the Marvel finalists against each other on the other. First week of April we’ll let YOU declare the best Comic Book Movie Film franchise. Catch up on previous shows! Download our podcast on iTunes!